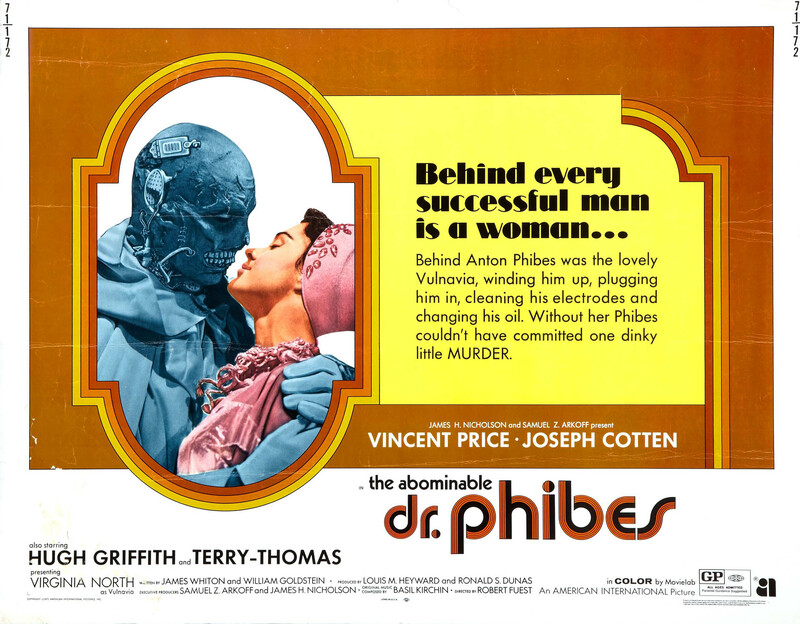 Since it’s Halloween, this week’s entry is the campy horror classicThe Abominable Dr. Phibes. Vincent Price is out to avenge the death of his wife and not only eats the scenery, he devours the entire set. TCM is running a Vincent Price horror fest tonight. I think this one is on the later list. Hoping to catch Masque of the Red Death while eating sausages at Rosamunde, here in SF. Wow, the whole thing on Youtube? Now, I can’t recall, was it the original Dr. Phibes, or the “Return of” (or both) where Vincent Price never spoke on screen…? I think there were voiceovers, but that’s all. And the speculation was that the producers couldn’t afford Price in a “speaking role”. Or perhaps I’m just misremembering some really cheezy movies. Thanks for the TCM recommendation. I now have plans for the evening. Another delightful Vincent Price movie isTheatre of Blood, in which Price plays a ham actor who murders his critics in recreations of famous Shakespeare scenes. Right up his alley, obviously. It’s got Diana Rigg in it too! Price was hamtastic. TCM is showing non-stop Hammer horror flicks all day culminating in the Vinny marathon. Agree that Vincent Price is the paragon villan. Loved Dr. Phibes and also seem to remember a sequel.